After spending 3 years in exile in the other financial hub of Asia, Diva finally managed to escape and moved back to Hong Kong. Hello Kitty decided to help him celebrate the joyous occasion, so the three of us ended up at Neighborhood for the early seating. Yellowfin tuna belly confit "ventresca" - apparently we didn't look at the menu carefully enough and didn't realize this was gonna be more cooked (well, it did say "confit", after all... and not "crudo"). It was very tender and delicious, and the mix of bell peppers, pickled guindilla de Ibarra, piment d'espelette powder and the garnish of lemon zest made for a pretty tasty dish. Matsutake mushroom / egg brouille - loved these matsutake (松茸) mushrooms, and naturally they paired well with œufs brouille. The trout caviar on the side was nice, too. Roast lobster / girolle / sweet corn - this was pretty good! I especially loved the sweet corn. Yellow croaker bottarga spaghetti - how do I ever say "no" to bottarga? The answer is that I can't. I HAD to order this. Never had bottarga from yellow croaker, but it sure was tasty! The thin slices of garlic mixed in didn't hurt, either. Yup, I could have a bowl of this (or three) all by myself. Baked macaroni / truffle beef shank ragu - this was very, very good. The macaroni became a little hard and chewy after baking, which I really liked. The truffled beef shank ragu was so, so, so good... Very tender and melt-in-your-mouth. The quenelle of crème fraîche on top completed the dish. Angelfish - we didn't think about ordering the daily fish, but while I was chatting with some friends at the bar, David mentioned that these angelfish / butterfly fish (荷包魚) were on offer, and that one doesn't see them everyday. When David drops a big hint like that, you take his suggestion and order the damn thing. The fish was really, really good. The flesh was incredibly tender, and the flavors from the skin (and the oil underneath) were particularly tasty - although I didn't get the sea urchin flavor that David claims they had. For this reason a few tongues of sea urchin came with the fish, although I must say I didn't really are for them. The 荷包魚 was served with a 荷包蛋... sunny-side-up egg... and I asked for extra bread to mop up the yolk. Loved the piment d'espelette powder on everything. Canelés - we were too full for dessert, but enjoyed our canelés. Apparently these are now made with proper copper molds from a certain ex-blogger... Crunchy on the outside and custardy on the inside. Parfait! 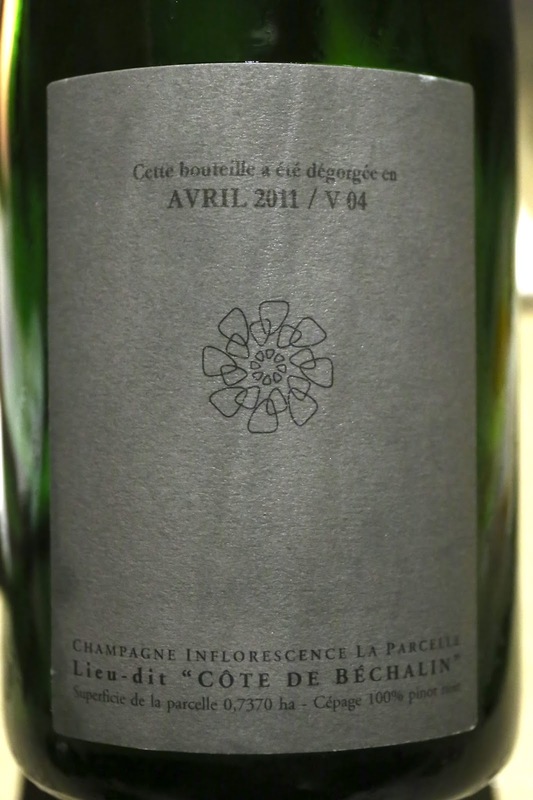 2011 Inflorescence La Parcelle Côte de Béchalin - 100% pinot noir. Yeasty, caramelized, ripe on the palate, with a little bit of acidity to balance it out.